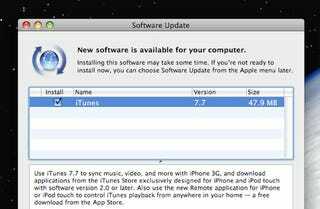 Click to viewiTunes 7.7 is available in "software update" for Mac and Windows. Apple's iTunes page also has it. You'll need this version for the new iPhone OS 2.0 version. The new version hasn't changed from the confidential pre-release we tested alongside iPhone OS 2.0. Like we said then, the apps sync tab in iTunes will not show until you have iPhone Firmware 2.0 installed.